Your contributions make our lifesaving work possible! 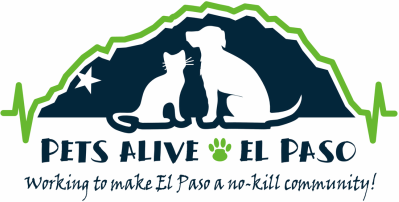 Pets Alive-El Paso is a 501(c)(3) non-profit organization — a public charity whose lifeblood is the generous donations of compassionate people like you. Whether by directly paying for a spay/neuter surgery (or two, three, or more!) or by helping cover our extremely modest, but inescapable, monthly overhead, your tax-deductible contribution today will make an immediate and deeply appreciated difference in our efforts to reduce pet overpopulation! All contributions are tax-deductible to the maximum extent allowed by law.